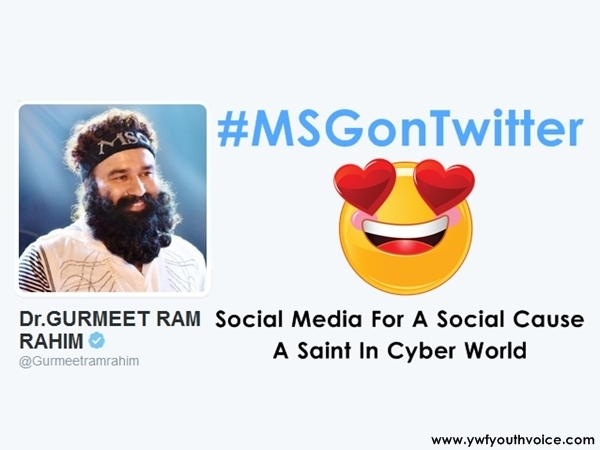 Rockstar Saint using social media for a social cause, he is the Saint who know how to connect present youth to spirituality. We all are familiar with this Saint, we know him as a social reformer, preacher, spiritual leader, movie star, rock star & designer. List of his talents is endless, that's why his fans consider him as Super-Human. Saint Dr. Gurmeet Ram Rahim Singh Ji Insan has doctorate for his world records in the field of serving humanity. He has received 55+ world records till now, it itself shows his dedication for working for society welfare. Dr. Gurmeet has found countless ways to bridge the gap between mankind and spirituality. As Dr. MSG says, there are many ways that a youngster, who is an atheist, can be connected to spirituality and that too through a medium he is comfortable with. His movie has a social message that depicts how meditation works. Also songs sung by him promote humanitarianism, and make a hard-hitting impact against drug addiction and corruption. Dr, Gurmeet Ram Rahim has great ability of sensing the need of hour. This Saint used to do Satsangs only then he started singing bhajans and then rock songs in live concerts called Rubru Nights. All his efforts paid him back, youth started to connect with him and his ideas, now you can see about 80% of his followers consist of youth. After this he decided to make a movie for the same reason, first movie MSG The Messenger proved to a Super-Hit by earning 170cr+ on box office. Sequel of this movie "MSG-2 The Messenger" is still in cinemas, even in its 30th week movie is running with 15-16 shows everyday. Movie has already crossed 505cr+ on box office, this shows how much youth is loving this Rock Star. ‘Dhan Dhan’ (only God is worth praising) — ‘Satguru’ (the Supreme Being) which is synonymous with the words Om, Allah, Waheguru, Ram, Parmatma, God, etc., as used in many of the world’s religions — ‘Tera Hi Asra’ (we are solely dependent on HIM and only HE can help us everywhere in all eventualities). On his twitter handle, Dr. Gurmeet Ram Rahim keeps encouraging youth time to time for different kind of welfare works like Safai Abhiyan, Tree Plantation, Blood Donation, Helping Poor and many other things. He also tweets to promote everyone to use their right to vote, women empowerment and other national international problems. He also keeps his followers updated with news of his movies, MSG Private Limited (he's its brand ambassador), Dera Sacha Sauda works and events. Within no time Dr. MSG became famous in twitter world, almost every hashtag he use makes its place in national and sometimes in international trends. Every hashtags receives lakhs of tweets which shows that his decision to step in the cyber world proved to be right. We hope more and more youngsters start following his ideas and leave their vices like drug addiction, non-veg food etc.